Yes, I’m one of those people. Unless it’s stained, has holes in it, or I just didn’t like it, I have pretty much every piece of baby clothing that my boys ever wore in overstuffed bins under every bed in our house. Despite my initial horror (and, funny enough, my husband’s too) of taking scissors to a gorgeous onesie, I figured sentimental pieces are best suited to hanging on a wall vs. sitting in a bin under the bed. So this is what I came up with. 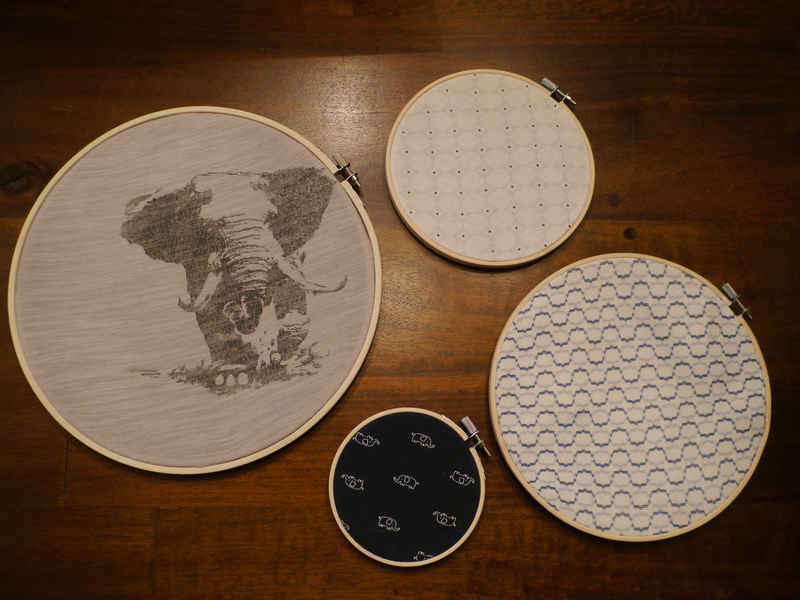 Bamboo embroidery hoops. Michael’s sells a 3-pack (4, 6 and 8-inch hoops for $16.99) and I also bought a 10-inch version for $2.79. If you’re feeling fancy, you can find vintage hoops online too. 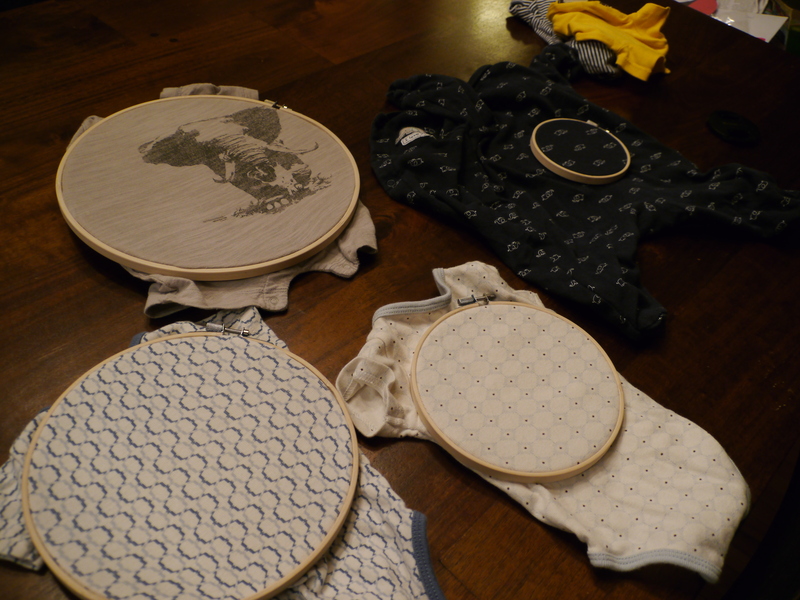 Selection of fabrics – I used baby onesies, but you can use T-shirts or any other fabric you wish to put on display. As I already owned the fabric, my total investment was about $20. It took me roughly 30 minutes for this project as I played with different fabrics before deciding which ones I was going to use. Choose your fabrics. They could have fun patterns, a theme or just sentimental value. I played with a few different onesies but settled on a few I loved and that happened to go well together. Try a variety of fabric combinations to see what you like before you commit by making any cuts. I considered this newborn onesie but ended up going with a different look. It would be fun for a kids room though! 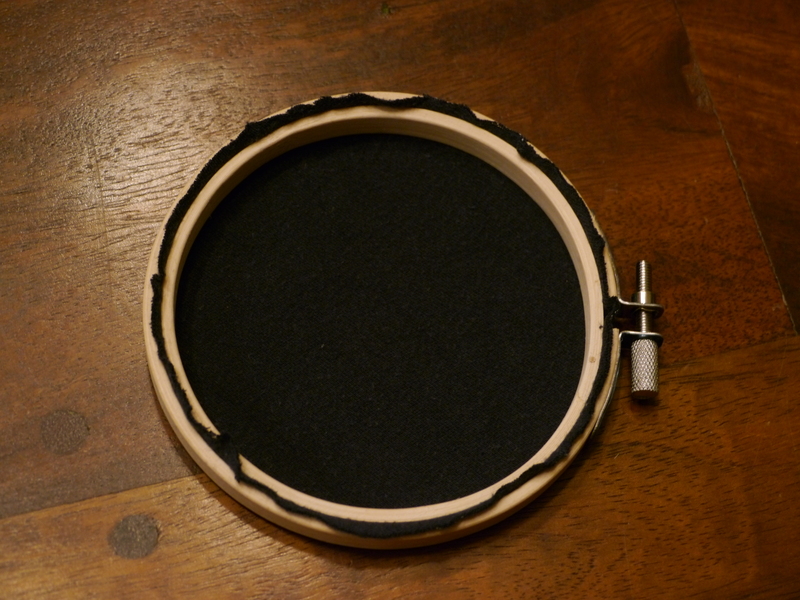 To secure your fabric, unscrew the screw on the hoop about halfway, and slide the two hoops apart. 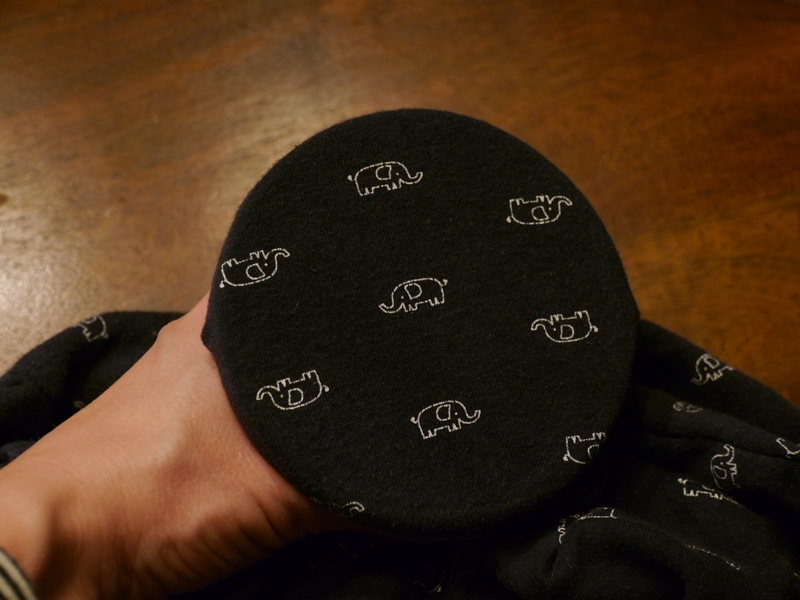 Place your fabric over the smaller circle. If you’re using a onesie, you will need to slide the smaller hoop into the onesie and behind the fabric you are going to display, as two layers are too thick to properly secure the second hoop on top. Adjust your fabric until it’s lined up the way you like it and slide the second larger hoop over top, firmly securing your fabric in place. Pay attention to the position of the screw so all your onesie circles have the screws lined-up in the same direction. I slowly pulled my fabric from the back to ensure it wasn’t pulling too much in any direction and the pattern on the fabric was centred. When you’re happy, tighten the screw. Place the smaller hoop behind the fabric. Ensure any patterns are lined up the way you want them to look before securing the fabric in place. 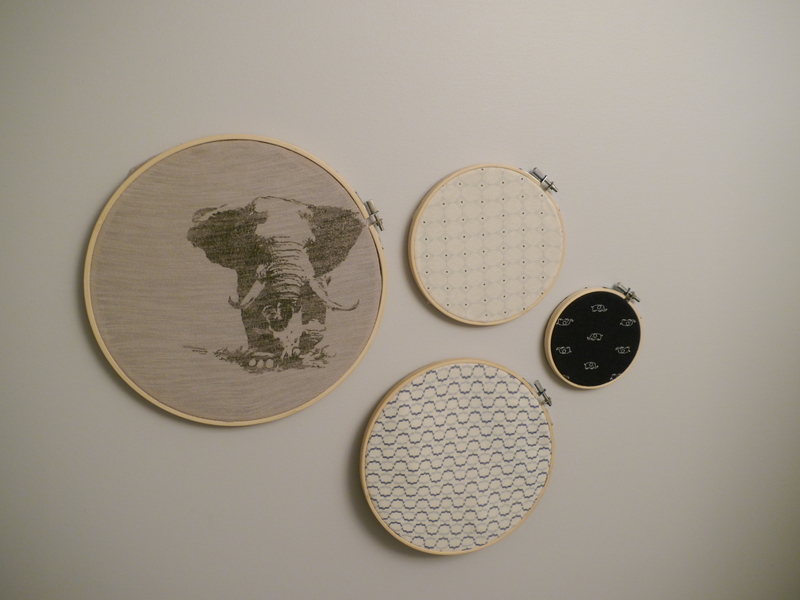 After your fabric is secured, trim the fabric so the hoop can rest flush against the wall when hung. Lay out your circles to determine how they should be arranged. Don’t spend too much time on this step as it will likely change once you start mounting your art on the wall. Step 5: Hang your hoops with removable wall hooks or even simpler, push pins. My finished design. I played with a few layouts before landing on this one. Note: the bottom hoop isn’t quite flush as I couldn’t bring myself to cut the onesie. I like this project because it’s inexpensive, versatile and is easy enough to do with kids. When you’re tired of your decor, change it up! 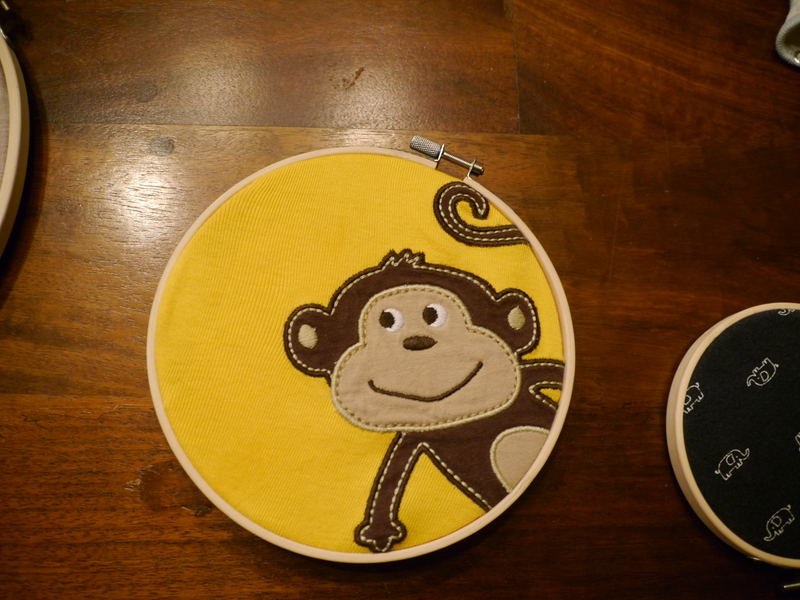 Reuse the hoops to mount kid’s art or a piece of gorgeous fabric. You can even paint the rings to add flair. If you’re looking for more inspiration, here’s a cool example of a kids room that one crafty (and talented) mother created – and some of these designs are gorgeous too. ← Hawaiian Stitch Themed Birthday Party and a “Cake Free” Cake!